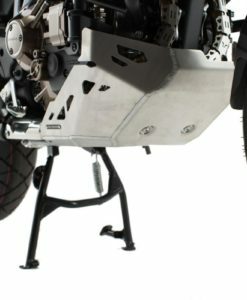 The SW-Motech range of engine guards, bash plates & skid plates are made from rugged aircraft grade aluminium which is further welded & pierce riveted for lasting durability and strength. 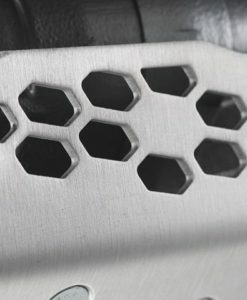 Pierce riveting is a state of art technology that is also used in the construction of an Audi TT. 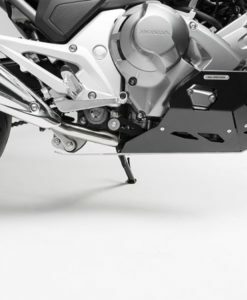 There are therefore no weak points as a result. 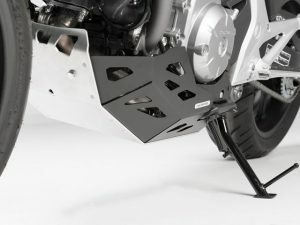 SW-Motech is the only company employing this type of advanced construction in motor cycle protection products. 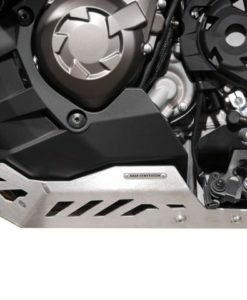 Attention to detail includes air flow cutouts for optimal engine cooling. 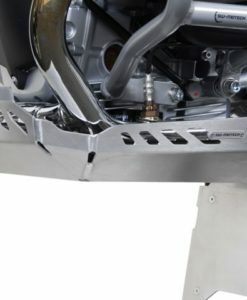 Where necessary easy access to the oil drain plug bolt allows the oil to be changed without removing the engine guard. 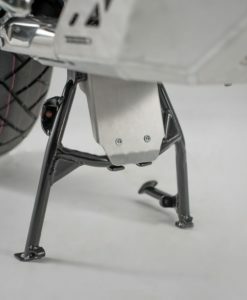 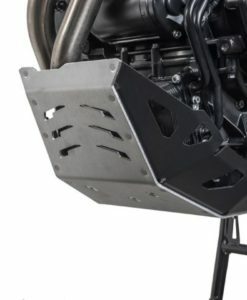 The base plate of the engine guard includes side protectors that wrap around the engine block to provide both bottom and side protection. 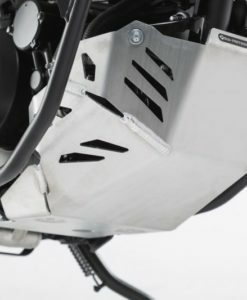 The logic behind this design detail is simple: the more the skid plate covers, the more parts are protected. 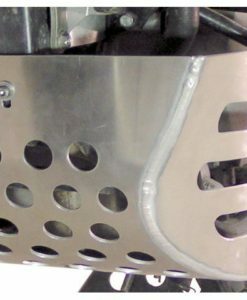 Where necessary rubber shock dampening elements are also employed. 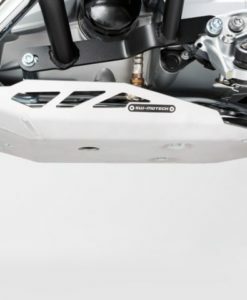 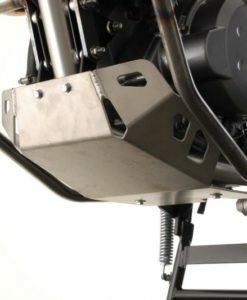 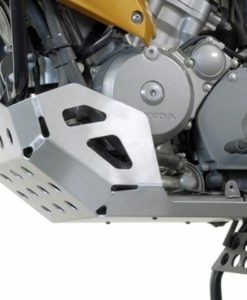 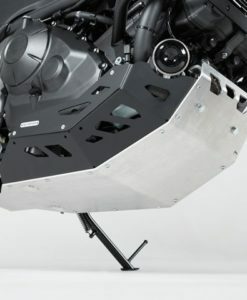 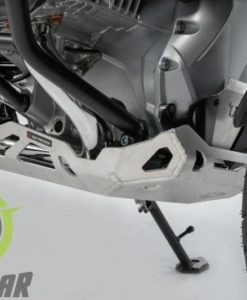 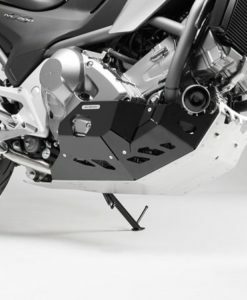 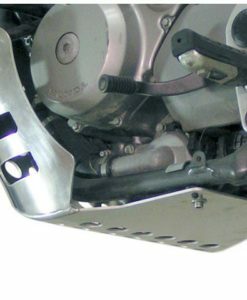 As an example the BMW R1200GS engine-guard has been designed for South African conditions and includes these rubber isolation mountings and high sides to protect the exhaust and engine sump (the standard engine guard leaves the sump and exhaust extremely vulnerable). 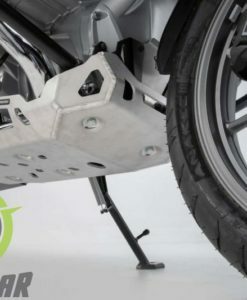 Installation is an easy bolt on procedure with all mounting hardware included. 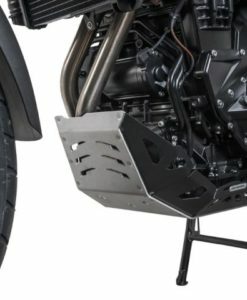 Avoid being left stranded by a jagged rock punching a hole in the bottom of your engine, oil cooler or any other vital component. 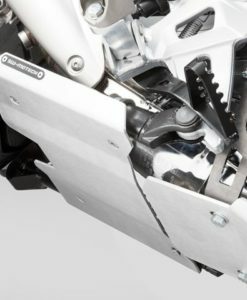 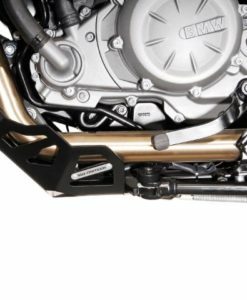 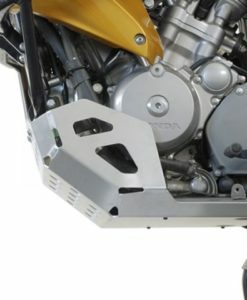 The particularly robust engine guard made of 5-mm thick brushed aluminum for the BMW R 1250 GS Adventure. 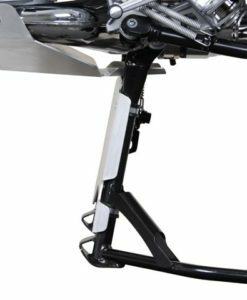 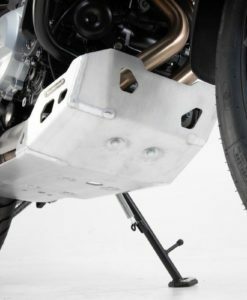 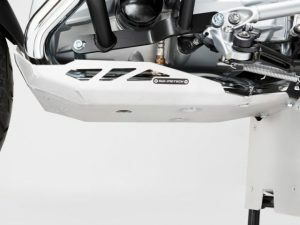 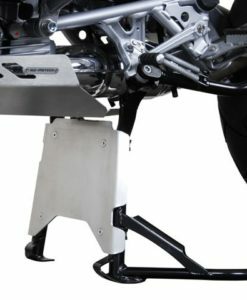 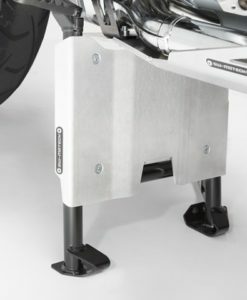 SW-MOTECH Skid-plate Extension for Center-stand when used in conjunction with the SW-MOTECH Engine Guard provides complete under-body protection. 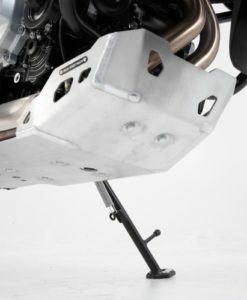 SW-MOTECH Bash Plate Extension provides additional protection to valuable engine parts. 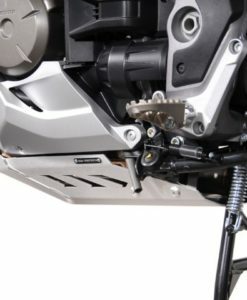 SW-MOTECH Aluminium Skid-plate protects the most important part of you bike, on-road and off-road. 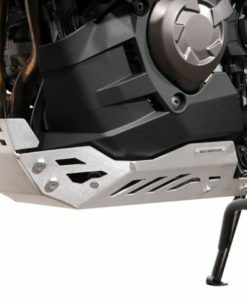 SW-Motech Engine Guard is made of rugged 3 mm laser-cut and pierce riveted aircraft alloy aluminium for lasting durability and strength. 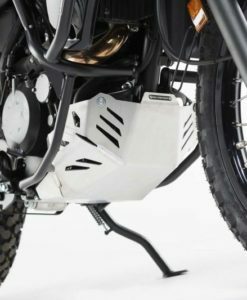 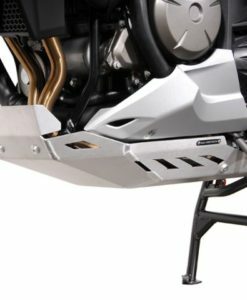 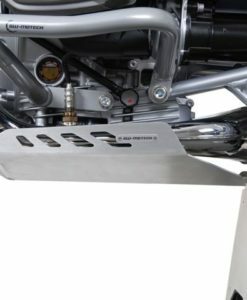 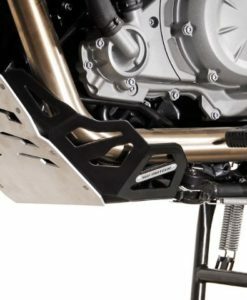 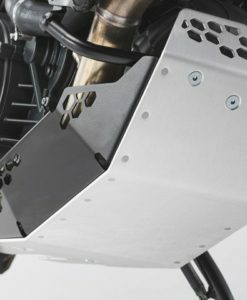 The SW-MOTECH aluminium skid plate engine guard for Kawasaki KLR650 ’08-’17 protects the undercarriage and vulnerable lower engine cases from damaging stones and other trail obstacles. 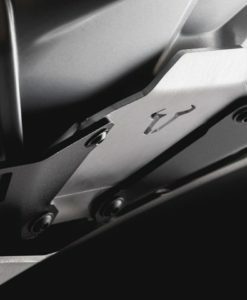 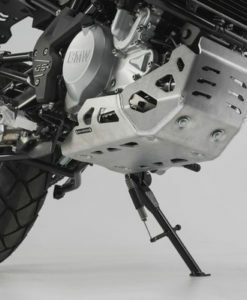 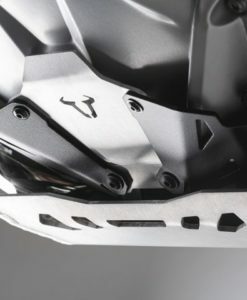 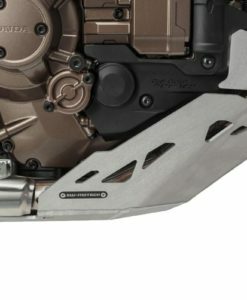 Kawasaki Versys 1000 Bash-Plate offers efficient under-body protection against chipping and collision. 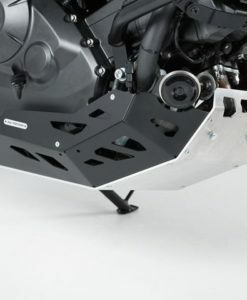 SW-MOTECH Bash Plate protects the engine from stone chipping and collision.